COAST - Fighting for the taxpayers, not working against them! : Early Voting Has Never Been Easier – Why let the Democrats Have All the Fun? Early Voting Has Never Been Easier – Why let the Democrats Have All the Fun? Early Voting begins Tuesday, October 2. 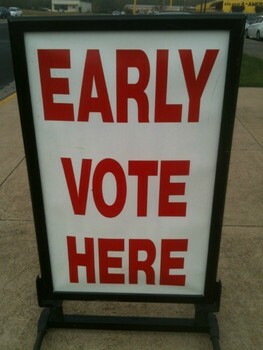 Democrat Groups and the Obama Turnout Machine are planning to vote early and lock in their votes. What do the Democrats know about early voting that Conservatives have forgotten? Remove the risk of inclement weather or unforeseen circumstances. Request an absentee ballot or vote early in person and make sure your vote counts! Early and absentee voting can be the key to this year’s election. And, perhaps best of all, once your ballot is turned in, THE PHONE CALLS STOP, THE MAILERS STOP, THE KNOCKS ON YOUR DOOR STOP! Every night, the parties and leading issue groups get updates from the local boards of election on who has turned in their ballot. Once your ballot is in, these groups know not to waste their time and money calling you because you've already voted! Make your vote count, stop the phone calls and mailers: VOTE EARLY! 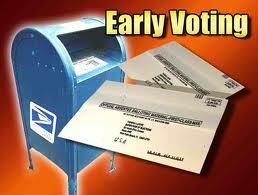 Early Voting can be done by mail or in person at your County's Board of Election Headquarters. Below are links to your local board of election and the forms necessary to check your registration, register, vote early, request an absentee ballot and update your registration. This year is a redistricting year, so use the links below to verify which Congressional and State Rep. District you're in.